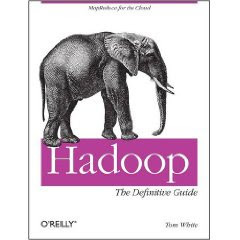 After a busy couple of months I've finished the writing for "Hadoop: The Definitive Guide". It's now going through the production process at O'Reilly. You can pre-order it on Amazon and O'Reilly. You can also get the Rough Cuts version from O'Reilly to read today, although it hasn't yet been refreshed with my latest draft (I hope that will happen in the next few days). Here's the final chapter listing. Readers of earlier drafts will notice that the number of chapters has grown: this is because the elephantine MapReduce chapter has been split into three (chapters 6, 7, and 8) to make things more digestible. The writing's done but I still have to package up the example code. I'll be doing this soon, and it will appear on the book's website. Having worked with a few other authors, I have some appreciation for how much effort it can be. I look forward to buying my copy. Congratulations for finishing it! I shall place my UK order in and hope to be in there with support calls shortly afterwards! Congrats Tom, I'm looking forward to reading it. I bought your book, but I didnt find any info about how to do subclusters. I dont know if you know what I mean. Where can i post problem? Most people run jobs across the whole cluster. In this way, you get to multiplex the work, which leads to better overall efficiency. There are a number of work schedulers available now (e.g. the fair share scheduler) which can be used to segregate jobs, and give them guaranteed resource allocations. See http://hadoop.apache.org/common/docs/r0.20.0/fair_scheduler.html for more details. Regarding your question about where to ask these questions - see the mailing lists at http://hadoop.apache.org/common/mailing_lists.html.